Use the time-tested strategies in this audio collection from America’s leading communicators and bestselling authors to learn and practice your skills. Your words matter, as does how you carry yourself when you speak. When you communicate your vision with passion and fire, you will move people into action. 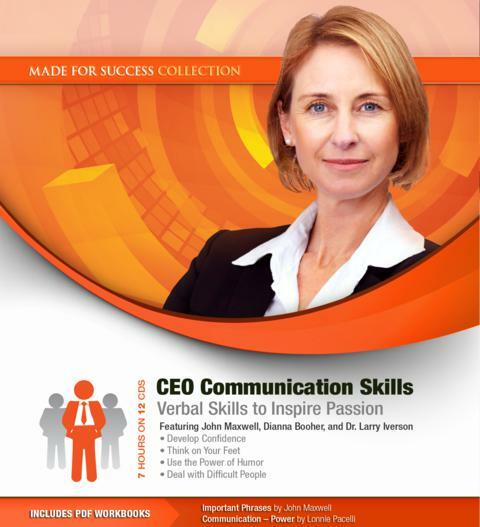 Some people say communications skills are essential to your business success, but advance skills are rarely taught in schools and universities. Now you can learn at your own pace at a time that’s convenient for you, while you commute or workout. Understand how you can become a “leader manager” and advance your position in the workplace. JOHN C. MAXWELL, known as America’s expert on leadership, speaks in person to hundreds of thousands of people each year. He has communicated his leadership principles to Fortune 500 companies, the United States Military Academy at West Point, and sports organizations such as the NCAA, NBA, and NFL. The New York Times bestselling author has written more than thirty books, including Winning with People and Today Matters. Two of his books, Developing the Leader Within You and The 21 Irrefutable Laws of Leadership have each sold more than one million copies.